After barking up the wrong trees for our holiday small screen entertainment, we have found something that works; Designated Survivor on Netflix. It’s not The Crown and Kiefer Sutherland is no Claire Foy. But as new heads of state, after the deaths of their predecessors, there are similarities. 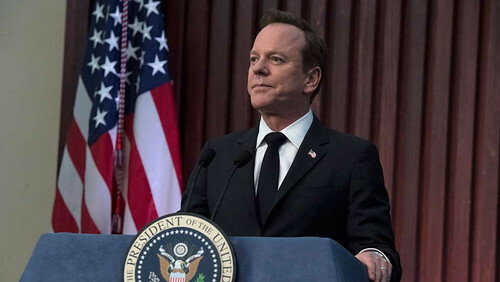 I was surprised at first to discover that Tom Kirkman, as he is, had no idea what his role as designated survivor actually meant, but he soon finds out when the Capitol is blown to smithereens, with everyone – well almost everyone – inside it dead, and he is sworn in as President of the United States. Seen as a weak man by most, he struggles, but it seems his inner decency will carry him through, despite all the back-stabbings, despite all those deaths and the need for calm and cooperation. I have no idea how real this might be, apart from the bombing of the Capitol, but it makes for fascinating viewing. We’ve been without a decent POTUS for too long in real life, so this makes for a nice change. Never having watched the West Wing, I don’t know if this follows in its footsteps, or if Designated Survivor is making its own tracks. And what a perfectly polite but awful adversary Congresswoman Kimble Hookstraten is. I quite like her. To begin with I couldn’t see how this series could be so long. I mean, how much time do you need to install a new man as President and start him up? But I could keep watching this. If it weren’t for the deaths of so many innocent people, I’d prescribe this as a good way to proceed. This entry was posted in Television and tagged Adan Canto, Italia Ricci, Kal Penn, Kiefer Sutherland, LaMonica Garrett, Maggie Q, Malik Yoba, Natascha McElhone, Netflix, Virginia Madsen. Bookmark the permalink.